Freight Farms: How Boston Gets Local Greens, Even When Buried In Snow : The Salt Big metal shipping containers are often used to import food from around the globe. Now, two Boston entrepreneurs are modifying those containers to grow local produce hydroponically, 365 days a year. Freight Farms are shipping containers modified to grow stacks of hydroponic plants and vegetables — anywhere, 365 days a year. The United States imports more than $100 billion of food every year from farms across the globe, often in the big metal shipping containers you see on cargo ships. Now, entrepreneurs are using those shipping containers to grow local produce. "Freight Farms" are shipping containers modified to grow stacks of hydroponic plants and vegetables. It's a new way for small-scale farmers to grow crops year-round in a computer-controlled environment, even in the middle of the city. 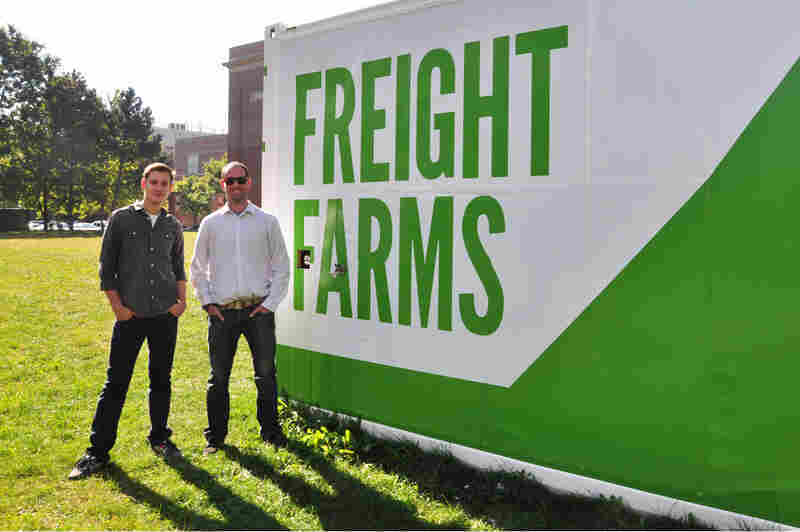 Freight Farms co-founders Jon Friedman and Brad McNamara started their Boston-based company in 2010. At first, they tell Here & Now's Jeremy Hobson, they were looking at growing food using urban rooftops. Then they "realized that there was a much larger opportunity to empower more people in different spaces than just your unused roof space," McNamara tells Hobson. Friedman and McNamara say their goal was to cut down on the number of miles it takes to get greens from farm to table, so you can grow local food anywhere. Jon Friedman (left) and Brad McNamara (right) are the co-founders of Freight Farms. The shipping containers are insulated, and all the systems – from pumps to irrigation to LED growing lights – can be digitally controlled. The Freight Farms are also Wi-Fi hot spots, so farmers can check on things like pH levels remotely using a mobile dashboard. "They can set alerts. They can set alarms," McNamara says, adding, "So if you're at home and it's really cold outside, your farm is covered in snow, you don't actually have to leave your house to go check on things." 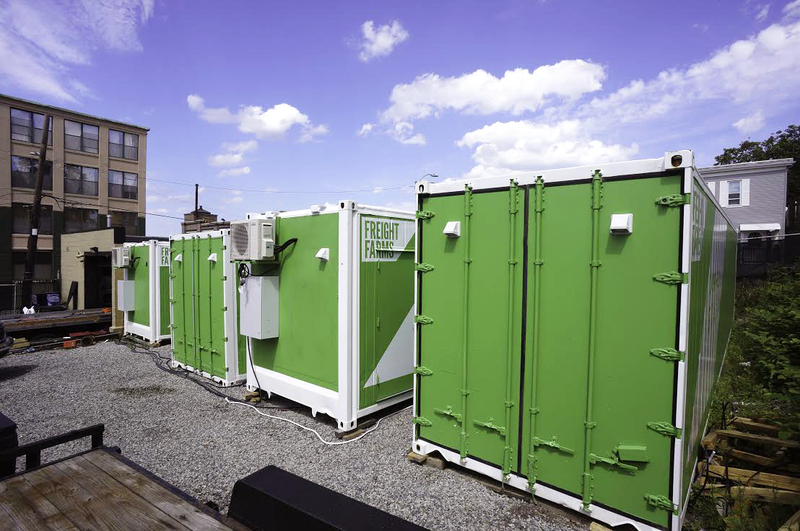 Freight Farms says it has sold about 25 of the containers so far, at a cost starting at $76,000 each. Shawn and Connie Cooney are two urban farmers putting the technology into action in Boston. 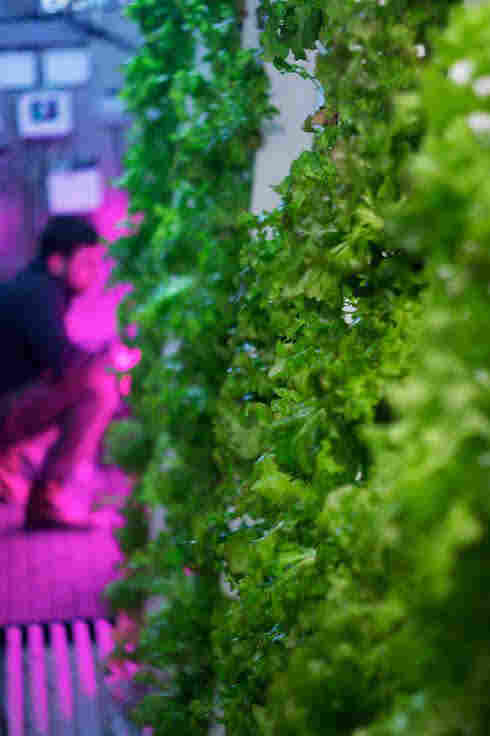 "In a city, you can grow enough produce using this technology to make a scalable business. So you can sell wholesale as well as retail and have a real business," Shawn Cooney tells Hobson. The couple is currently growing greens including kale, cilantro, mustard greens and wild mint. Like a library of plants, the herbs and vegetables are neatly organized in towers of leafy greens. The Cooneys sell most of their produce to restaurants via wholesale distributors. Lettuces, brassicas and herbs grow in a Freight Farms container. "No we're at the point where we're asking what the restaurants want," Connie Cooney says. Mustard greens, with their wasabi-like finish, are a popular request. With a 365-day growing season, the Cooneys are always in business. Their four freight containers can yield as much produce as four acres of land – in less time, they say, than it would take to grow on a traditional farm. "If you give them the right nutrients, they taste as good, or better, as they would coming out of a dirt farm," Shawn Cooney says. Even though watering, lighting and the addition of nutrients are all automatically controlled, "there's still a lot of farm work going on," Shawn Cooney says, adding, "You still have to come in and take care of the plants." At this point, the Cooneys' business is breaking even. Now that they have a handle on the farming aspects, they can tailor their produce to what people want and focus on profit. And while the Freight Farms system may seem particularly useful right now to Bostonians, with their city entombed in snow, Friedman hopes to see farmers all over the world adopt his company's growing system. "We see a lot of potential in a lot of other countries besides the U.S. [that] don't have access to food, [that] either have a large urban sprawl or just don't have the distribution system that we have in the U.S," Friedman says. This story comes to us via Here & Now, a show produced by NPR and member station WBUR in Boston. You can listen to an audio version of this story on WBUR's website.